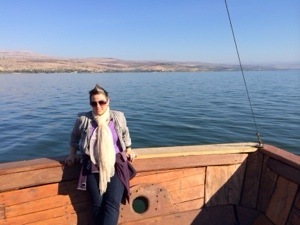 Today I sailed on the Sea of Galilee, walked through Capernaum, visited Ceaserea Phillipi. I have been walking where Jesus walked, and it is one of the most profound faith experiences of my life. 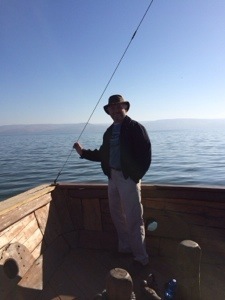 Sailing on Galilee was my favorite experience of the day. Maybe because the weather perfect, or maybe because they played some Michael W. Smith and Maranatha praise choruses (which I was raised on from the time I was old enough to go on roadtrips with my parents) as we travelled out to the middle of Galilee…but it got to me. Even now I struggling to find words for the way I felt out on the water. Geoff read the story of Jesus calming the storm from the Gospel According to Mark to our group and Ali read the passage where Peter walks on the water. The words are so familiar to me – I have been hearing these stories in Arch books and Sunday School lessons and sermons my whole life. But today these familiar words sounded different…new. Both more real and more mysterious than ever before. I didn’t just get a little misty-eyed, I had tears flowing down my cheeks. I came to faith in Jesus when I was 19 years old. That was the moment I asked Jesus to be my Lord, my leader, my savior. But in some ways I have always believed. I don’t remember a time when I didn’t want to go to church, or learn about my faith or sing the songs of my faith. In some ways, my faith feels like so much a part of me that it must be stamped in my DNA – the way that being short or having brown hair is part of my genetic makeup. I just have to remind myself that with God, this isn’t a one-time statement. It is a promise – new life, renewal, a new person…over and over and over again. So today I am overwhelmed and weepy – in a very good way.